What if grad school instead of pass/fail was live/die? Stephanie Blackraven considered herself a normal grad student: BS electrical engineering, MS in systems engineering, MA in archeology, and working towards a doctorate in energy physics, and mystology. So, maybe not normal, normal, but not weird. She discovered that some symbols, when created properly, contained energy. Just a little bit of energy. Working with another grad student, Bruce Richardson, she is trying to decipher the mathematical physics behind the phenomena. Then, someone breaks into her lab to destroy her equipment, four times. A policeman, Joe Bremer, shows up in class asking about her symbols and how they could be used in crime, gang related crime. Then she powers a really big symbol and creates a force field. That’s when life starts getting weird. 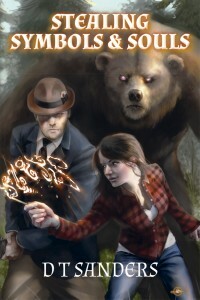 She falls in love with Joe, only to find out he’s a werebear. Stephanie finds herself involved in gang crime, dirty cops, werewolves, murder by symbol, assassination and in the middle of it all, her scary great uncle dies and leaves her everything, including someone trying to kill her. The only way she’s going to survive it is if she figures out why. Do you miss Stephanie and Bruce, Joe Bremer and Tom, and all the rest of the Blackraven extended family? Can’t wait until the next novel is out? Want to find out what is up in this amazing world of symbols (not magic!) and science? You are in luck.